Our Baby Lotion is the gentlest in the Bee Loved range, free from chemicals and harsh ingredients, and proven to soothe, nourish and protect precious little bodies. With a light, milky consistency that glides on easily, Bee Loved’s Baby Lotion is made from a comforting free-from blend of aloe, lavender, chamomile, shea butter and cocoa seed butter that restores hydration after exposure to elements such as the weather, bathing and air conditioned environments. 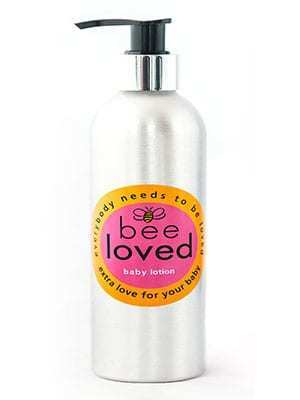 Bee Loved Baby Lotion is also particularly effective for soothing angry, red skin associated with conditions such as eczema. Using the powerful anti-inflammatory properties of chamomile to calm inflamed skin, aloe butter to accelerate healing and cocoa seed butter to form a protective barrier on the skin to guard against moisture loss, Bee Loved Baby Lotion is cherished by mums and dads eager to soothe their little one’s skin naturally. Our Baby Lotion is the kindest to skin in the Bee Loved range, free from chemicals and harsh ingredients, and proven to soothe, nourish and protect precious little bodies. With a light, milky consistency that glides on easily, Bee Loved’s Baby Lotion is made from a nurturing, free-from blend of aloe butter, lavender, chamomile, shea butter and cocoa seed butter that restores hydration after exposure to elements such as the weather, bathing and air conditioned environments.